I went to Arizona last month and drove US89 the entire way–first time I’ve done some sections in a couple years. One of the best parts was getting to meet my first Arizona retailer: Brett Gerasim. 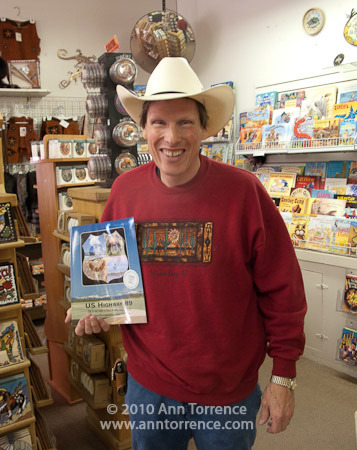 Brett and his wife Mary Ann run the Old Livery Mercantile, a cool gift shop in the heart of Wickenburg and right on old Highway 89. The store is across the street from the historic jail tree, an old mesquite tree to which Arizona’s law-abiding citizens chained their prisoners for the duration of their sentence before the first jail was built. Wickenburg’s biggest annual event, Gold Rush Days, starts tomorrow. If you are in Wickenburg this weekend for the festivities, stop in and say hi to Brett and Mary Ann.